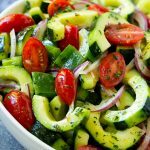 This cucumber tomato salad is full of fresh sliced cucumbers, cherry tomatoes, red onion and green peppers, all tossed in an herb dressing. The perfect light and refreshing side dish for any summer meal! Cucumber salad is a mainstay of summer parties. It’s inexpensive, easy to make and so refreshing on a hot day. My version is a mixture of cucumber, tomato, red onion and green bell pepper for an amazing combination of flavors and textures. 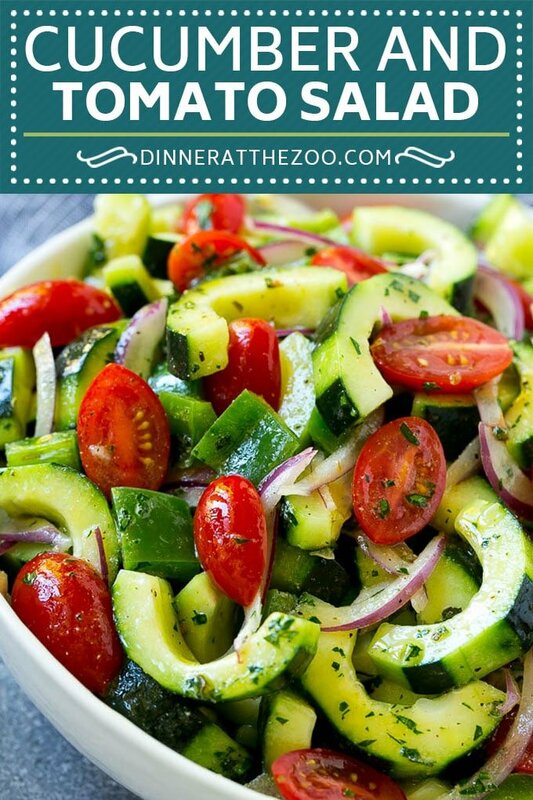 I am in love with summer salads like this cucumber tomato salad. Not only are they easy to make, but they’re just so fresh, and you can eat a lot of salad without feeling weighed down! I especially love when there’s a summer get together and I get to make more than one delicious chilled salad like this one. HOW DO YOU MAKE CUCUMBER TOMATO SALAD? 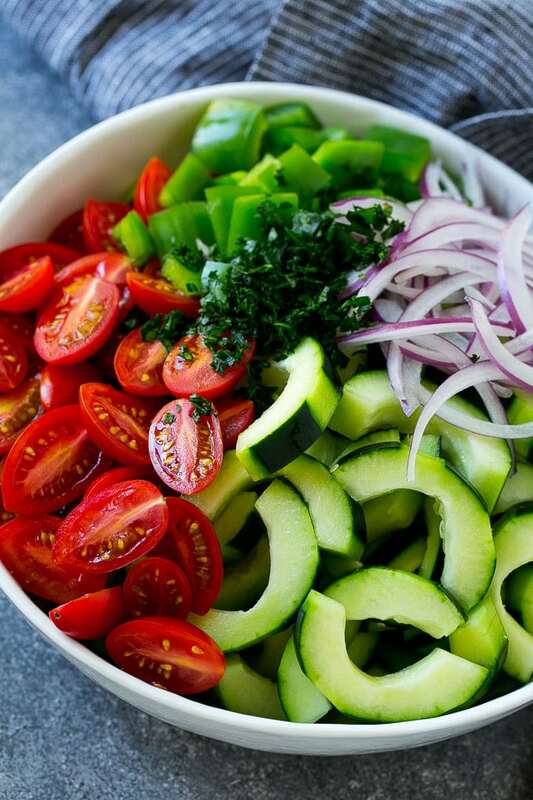 Start by slicing your fresh cucumbers, tomatoes, bell peppers and red onions and place them in a bowl. In a separate bowl, add the ingredients for your tasty herb dressing and mix well. Pour the dressing over the top of your fresh vegetables, toss to mix, and you have a perfectly light salad that goes with any summer meal! Any type of cucumber is fine for this tomato salad as long as you remove the seeds before slicing. I’ve made this salad with standard waxed cucumbers, English cucumbers and little Persian cucumbers and it comes out great every time. Red, yellow, or orange bell peppers work just as well as green bell peppers and add a great burst of color. I like to use cherry tomatoes, but diced ripe tomatoes are also a good choice. There are so many different ways to customize this salad! You can make your cucumber salad Italian style by adding cubed salami and mozzarella balls. It can also be made Greek style by adding olives and feta cheese. I love how simple it is to turn the base recipe into something different, because I love a little variety with my salads. CAN THIS CUCUMBER TOMATO SALAD BE A LIGHT MEAL? This salad, as is, is delicious but is missing some ingredients to make it a nice lighter meal. In order to make it more well-rounded, I add some protein such as grilled chicken, shrimp or chickpeas. You could also add cheese to up the protein content. Once you add a source of protein to this salad, it can definitely be served as a meal. Outside of having little to no calories, cucumbers have a high water content which can help keep you hydrated. Not to mention, they contain many vitamins and minerals that your body needs on a daily basis. 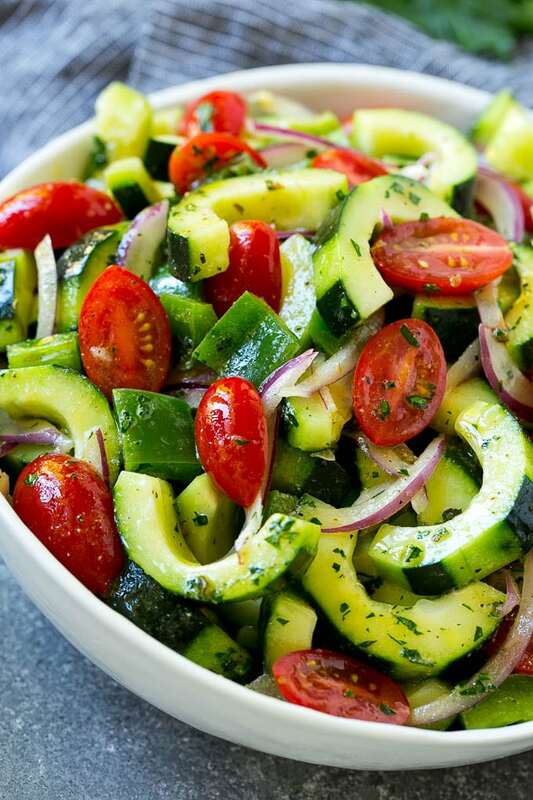 So, consider this cucumber salad a great healthy addition to your day! 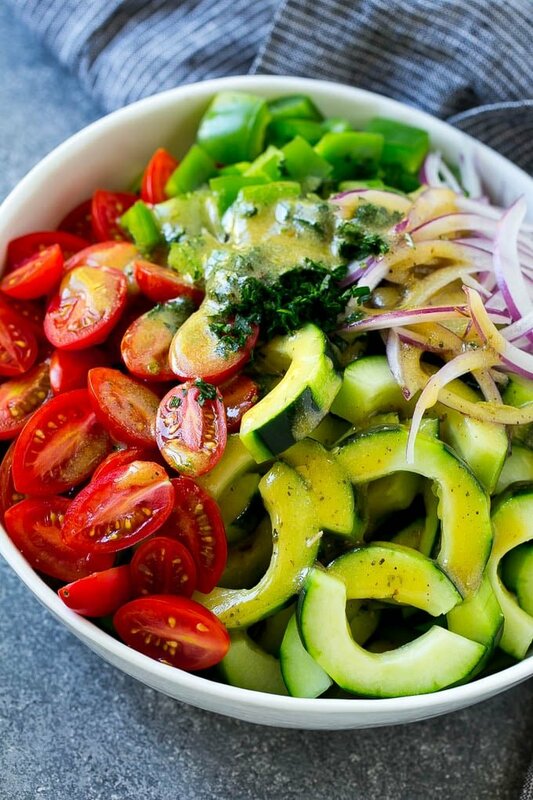 Place the cucumbers, cherry tomatoes, red onion, bell pepper and herbs in a large bowl. In a small bowl, whisk together the olive oil, red wine vinegar, Dijon mustard, salt, pepper and oregano. Pour the dressing over the vegetables. Toss gently to coat. Serve. Can this salad be prepared a day in advance? Yes it can, you may want to add the tomatoes right before serving though as they’re soften a bit in the fridge! 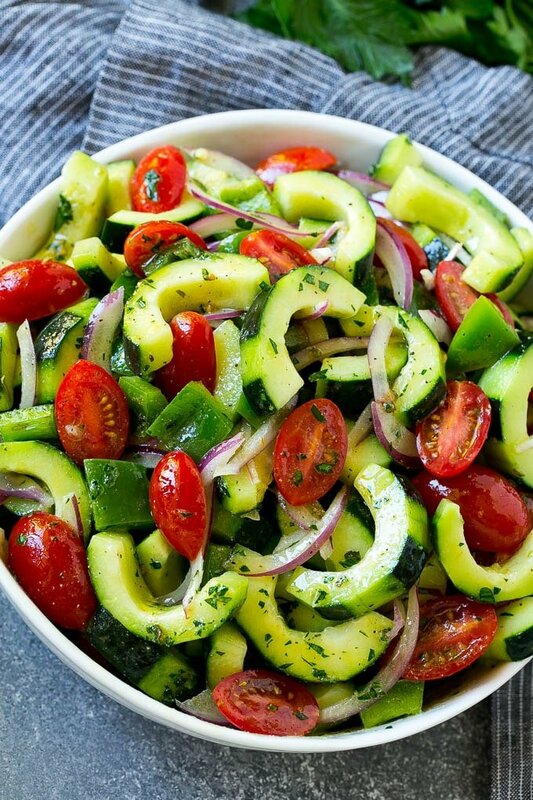 Mmm….perfect summer side dish! Can’t wait for all these ingredients to start coming from my garden so I can throw this tasty salad together! I’m growing my own tomatoes this year and this looks so yummy for my harvest! It looks amazing! I love salads in the summer because they’re light but also quite filling! This is something that I don’t mind making. Looks like the perfect side or fish and poultry. I am adding this to our menu plan for next week. I am planning on making parmesan crusted salmon on Monday, and of course this cucumber tomato salad too. I am obsessed with cucumbers lately! I would love to try this refreshing salad! I love summer salads too! this one looks so beautiful, nice touch adding the green bell peppers, and that herb dressing…oh yeah!! Wow. So easy to make and perfect for the hot summer days. I would love to have this as a side when we grill our favorite meats and seafood. This salad looks so amazing! I love the vibrant colors. A great summertime recipe. Two of my favorite foods to put in a salad. Now I’m craving this salad. It looks so delicious!! I love summer salads and this one looks so delicious and easy to make. I think I can even have my nine year old daughter make it. That sounds so good! This is the perfect light salad for a hot Georgia day. I have to give this a try!